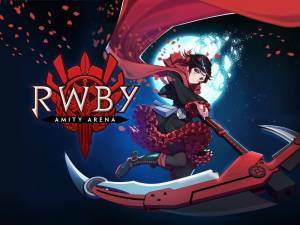 RWBY: Amity Arena is a competitive player-versus-player strategy game based on the anime web series of the same name and is very similar to tower defense games like Clash Royale. The game takes place on the world of Remnant where you have to put together a team of Huntsmen and Huntress from Vale, Mistral, Atlas, or Vacuoand and fight in the Vytal Festival. 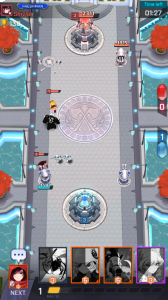 Once you have your team you can test them against your fellow guild members in friendly matches before taking on an opponent in real-time to improve your rank. During gameplay you will be collecting dozens of cards of your favorite characters from the RWBY universe and then using their unique dust-infused abilities, semblances, and weapons to knock out your opponents champions and destroy their Dust Towers. You will also be going on special missions around Remnant with your Huntsmen and Huntresses to recover more resources and cards. It is important that you have a balance between cheap and efficient cards and expensive powerful cards. Your deck of cards also needs to have a balance of cards so you are able to counter several different units from the opponent. Also make sure you don't put all your cards containing high aura in your deck as you have to wait for aura refils in order to summon them which will put you at a disadvantage during battle. Get in the habit of checking the card details for every character by clicking on the info of that selected card. The most beneficial time to level up your cards is during the early stages of the game, especially when you going F2P (free-to-play). You will find that common cards can be leveled up easily as they are not difficult to obtain from matches or chests. Every 12 hours or so the shop will rotate so make sure you regularly check it at least once every day. At the shop you will be able to buy individual unit cards cheap which is useful if you are on the verge of leveleling up and just need a few more cards. Remember though that the rarer the card, the more expensive it will be. You will find that if you can control the 'momentum' of the battle your chances of winning will increase dramataically. Controlling the 'momentum' of battle means that you take the initiative and force your opponent into unfavourable situations you can take advantage of. The central tower is defended by two side turrets which will attack nearby enemies automatically. The central tower will not activate unless it is attacked or one of its side turrets fall. Therefore the best strategy is to focus on one of the side turrets first. It is important that you understand the difference between skills, how they work, and which ones to use at the right time. Listed below are the different types of skills along with a brief description explaining what each one does. These skills will only activate under certain conditions and can be the key to winning some battles. These are skills that activate automatically and will provide the unit with consistent benefits. These skills must be activated manually by tapping the icon below the unit on the battlefield. How can you get Free Premium Dust? No discussions open for RWBY: Amity Arena at the moment.